WATCH: The Killers’ Christmas Video! The Las Vegas band reform to fight AIDS and send a warm holiday message. What can bring Las Vegas rock heroes the Killers, who have been on hiatus since early this year, back together? Christmas. And the band is in the mood for giving. 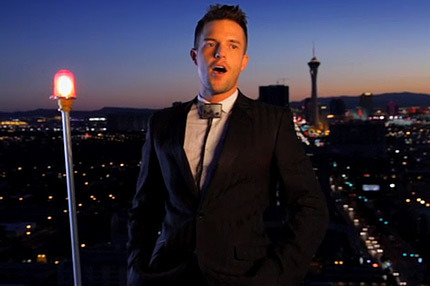 On Tuesday, frontman Brandon Flowers, who has been touring behind his solo debut Flamingo, and the boys released their fifth annual holiday single, “Boots,” and Wednesday dropped its music video. Watch below! Proceeds from the song, which you can buy via iTunes here, will benefit (RED) and help fight AIDS in Africa. For each view of the video (released to honor World AIDS Day), Starbucks will contribute five cents to the cause — views on our player below count towards the total. “Our Christmas single with (RED) is one of our traditions as a band.We didn’t want to let it fall by the wayside just because we’re on hiatus; this cause is too important,” said Flowers. The video starts with footage of holiday classic It’s a Wonderful Life, which is name-checked in the lyrics, then pans to Flowers standing atop a building surrounded by the shimmering Sin City skyline. He sings about reflecting on the past on the cusp of another year, perseverance through trying times, and ultimate redemption. Jared Hess (Napoleon Dynamite) directed. Watch the video below, then sound off in the comment section. For more details on the fundraiser, click here.